The chef in a cooking class I took a few years ago heated the milk and butter before adding to the potatoes, and I adapted this approach. This method doesn’t impact the taste, but does keep the potatoes warmer for longer. Peel the potatoes and quarter. Cover with water in a large pot and bring to a boil. Cover the pot, leaving an opening to let some steam escape. Cook for 10 to 15 minutes or until done. Potatoes should break apart easily when pierced with a fork. While the potatoes boil, place the milk and butter in a small pot. Warm over low heat until the butter is melted. Drain the potatoes and return pot to the stove on a burner at low heat. 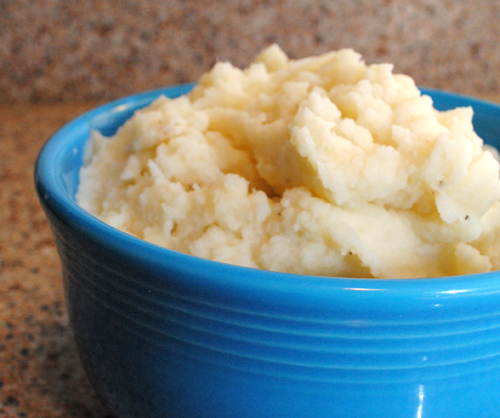 Use a potato masher or large spoon to mash the potatoes. Add the warmed butter and milk to the potatoes and mix with a whisk. Add salt to taste.